Tencarva Machinery Company LLC ranked 47th in the 2018 Grant Thornton North Carolina 100® rankings, which are listed in the October 2018 issue of Business North Carolina magazine. 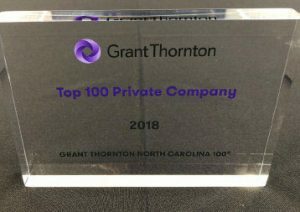 Grant Thornton North Carolina 100® (NC100) began ranking the state’s largest private companies in 1984 to celebrate the impact of private companies on the North Carolina business climate. Inclusion in the NC100 is voluntary, and rankings are based on revenue in the most recent fiscal year. Grant Thornton LLP (Grant Thornton) is the U.S. member firm of Grant Thornton International Ltd, one of the world’s leading organizations of independent audit, tax and advisory firms. Grant Thornton has revenues in excess of$1.7 billion and operates 59 offices.